Born March 9, 1959, Barbie Millicent Roberts grew up to be the most famous fashion doll in the world. Though most people probably don’t know her full name, nor that she claims Willows, Wisconsin, as her hometown, girls the world over have counted Barbie a close childhood companion and role model. And her parent company, Mattel, Inc., couldn’t be prouder. What does the phenomenon known as Barbie say about the world in which our children are growing up? With a demure sidelong glance, Barbie stepped onto the world stage at the American International Toy Fair in New York in March 1959. Looking ready for an upscale pool party in her black-and-white striped swimsuit and high heels, this attractive little doll was about to revolutionize the toy industry. What her creators couldn’t know is that she would also become the reflection of a changing society. Although the percentage of women joining the workforce in the decade after World War II was increasing, it was still widely assumed that a married woman with children would remain at home. Popular television shows such as Father Knows Best and The Donna Reed Show reinforced this traditional family model, as did advertising, so most parents bought their little girls toys that reflected their assumed future roles as mothers and housewives. The world Barbie was stepping into—the girls’ doll aisle—was therefore populated by chubby-cheeked toddlers and sleepy-eyed babies. But not everyone believed that little girls wanted choices. Handler’s own board of directors first had to be convinced that a teenage fashion doll would sell. After three years in development, Barbie received a tepid reaction at her Toy Fair debut. Many toy sellers were skeptical that this mature-looking new doll would really appeal to young girls. Fearing that her adult figure and sophisticated look would be off-putting to parents, some retailers simply refused to sell the doll. Although Handler was deeply disappointed with the lukewarm response, she pressed forward. Mattel already had in place a promotion plan for their toys using the medium of television—more specifically, children’s television. Still used with immense success today, this strategy circumvented parents and appealed directly to the company’s target audience. By the late 1950s, television was firmly established in most American homes, and with children’s shows becoming a growing segment of regular programming, advertisers were eager to tap the juvenile market. Mattel had become a commercial sponsor of the fledgling Mickey Mouse Club in 1955, three and a half years before Barbie was born. The paid-in-advance annual cost of $500,000 to sponsor the program carried considerable risk to the company, but within weeks after their first toy commercial ran in October of that year, the wisdom of the new marketing technique became apparent. Retailers quickly sold out of their stock of the advertised toys and were forced to order more to meet demand. The regularly televised ads provided a more consistent level of consumer demand for children’s merchandise than had existed previously, when toys were purchased for children primarily on the whim of their parents, and usually at holidays. As a result, children’s toys began to be carried in stores year round. Barbie’s first television commercial aired on The Mickey Mouse Club in 1959. Featuring several of the dolls, each wearing a different outfit (sold separately, of course), the ad emphasized the fun of imagining being grown up like Barbie. In the dulcet tones of the ad’s female singer, Mattel planted a dream in little girls’ heads: “Some day I’m gonna be ’xactly like you. Till then I know just what I’ll do: Barbie, beautiful Barbie, I’ll make believe that I am you.” Preteen girls were enchanted by the pretty little doll and her lovely, perfectly accessorized wardrobe, which always managed to accentuate her improbably tiny waistline and long legs. Barbie quickly became a best seller. In the first year after her introduction, more than 300,000 were sold at a pricey three dollars each. According to Handler, it took more than three years for production to catch up with demand, during which time the diminutive sensation traveled across the Atlantic to captivate Europe as well. It wasn’t long before little girls were demanding that Barbie have friends. So in 1961 Mattel introduced on-again-off-again boyfriend Ken, followed by best friend Midge in 1963, Midge’s future husband Allan in 1964, and Barbie’s African-American friend Christie in 1968. Additional dolls have regularly been added to the line, including younger relatives and a multinational and multiethnic circle of friends. Mattel’s desire to be inclusive led further to the introduction in 1997 of Becky, a perky little strawberry blonde who rolled onto the shelves in a pink wheelchair. In addition to dolls and their accessories, an extended product line includes Barbie-themed bicycles, skates, books, clothing, bedding and movies. Today Barbie is even on the Internet hosting a carefully controlled social network site for girls, while her official Web site features games, activities, and a link to the Barbie Collector site, with news, collecting tips and opportunities to purchase limited-edition dolls. (By some estimates, there are more than 100,000 active Barbie collectors worldwide.) Enthusiastic hobbyists and thousands of equally devoted children have unquestionably amassed not only an immense population of dolls but also millions of dollars worth of 1:6 scale clothing and accessories. Through the past half century, according to Mattel, the company has produced a billion outfits (with a billion pairs of shoes to match) for Barbie and her friends. And they have sold the dolls and their outfits to children and adults in more than 140 countries, making Barbie one of the most successful children’s product lines in history. By the manufacturer’s count, 90 percent of American girls between the ages of 3 and 10 own at least one Barbie doll. Barbie’s success has not come without cost. Mention her name in a group of adults and nearly everyone will offer an opinion about the toy. Her appearance, lifestyle and careers have been examined and discussed, but though her impact on the toy industry is apparent, there has been little empirical research on the effect she has on the children who play with her. Marketing specialist Kristin Noelle Weissman writes in Barbie: The Icon, the Image, the Ideal that “Barbie has both shaped and responded to the expectations of the marketplace.” Mattel’s ability to develop new advertising strategies and react to consumer desires has been a hallmark of the company’s success. However, Weissman goes on to remark that Barbie is also “a reflection of the values of the American popular culture.” While the doll has been judged a bad influence by some and held up by others as a positive role model, she appears to be less a trendsetter than a mirror in which we can view society’s changing course. As Barbie entered the work world, she was modeling an emerging pattern. The rumblings of the second wave of feminism were beginning to be felt. Women were being told that they shouldn’t have to settle for being “just” a housewife. Outside work promised a woman money of her own and a status that homemaking didn’t, and many women were ready to claim that promise. Barbie’s early professions were limited to those considered appropriate for a woman in the early 1960s—fashion model, student teacher, nurse, ballerina, flight attendant—but even so, Barbie represented choice and independence. Since then she has had, by Mattel’s count, more than 100 professions, representing many lines of work. Whether a fashion designer, paleontologist, NASCAR driver, pilot, military officer (decked out in a Pentagon-approved uniform), veterinarian, Olympian, or U.S. presidential candidate, Barbie has always been a career girl, and through the years she has reflected the changing nature of career options for women. Having no husband or children, Barbie has instead a world filled with possessions. Baylor University professor of philosophy Lenore Wright observes that “Barbie’s portfolio reflects her financial success, independence, and material wealth: a ‘dream house,’ a town-house, a convertible, a pool, a camper, a Jacuzzi, a couture wardrobe, a horse, a dog, and so on” (“The Wonder of Barbie: Popular Culture and the Making of Female Identity”). Barbie’s accumulation of goods mirrors the postwar consumer lifestyle that had been touted as a method of bolstering the economy. “Mass consumption in postwar America would not be a personal indulgence, but rather a civic responsibility,” according to historian Lizabeth Cohen in A Consumers’ Republic: The Politics of Mass Consumption in Postwar America. Not only was the desire for belongings important, but more than ever before, appearance became a commodity. Though its form has varied over time, beauty has always been valued, resulting in pressure to conform to whatever is considered beautiful in any given time. While Barbie has been accused of representing an unattainable physical ideal for girls, causing them to have self-image problems and in some cases eating disorders as they mature, Ruth Handler’s view was that Barbie’s shape actually “typified what the feminine ideal was in the late 1950s.” A cursory look at popular actresses of the time confirms that a slender hourglass figure was a popular media image. Through magazines, television and movies, women were subjected to pressure to meet that physical standard. That pressure has only increased in our media-saturated world. Women and girls are inundated by images and words, telling them what this season’s ideal look is and how to achieve it. Even Barbie has had her look altered several times over the years to keep up with changing beauty ideals. With the obsessive emphasis on appearance all around us, adults are rightly concerned that children should be brought up to have a proper sense of self. However, while the average little girl knows that Barbie is a toy, albeit one with a very unlikely figure, what will that same little girl make of the highly sexualized media barrage to which she will be subjected? Will she understand that despite ads telling her she can grow up to be just like Barbie, the chances that her own face, hair, body and wardrobe will resemble the gorgeous little doll’s are at best slim? Of far more concern than a shapely plastic doll should be the marketing in general—with its emphasis on beauty, popularity and material possessions—that children are exposed to in so many areas of their lives. Barbie’s 50-year reign as one of the world’s best-selling dolls is no fluke. Rather, her immense success is the product of careful research and marketing. 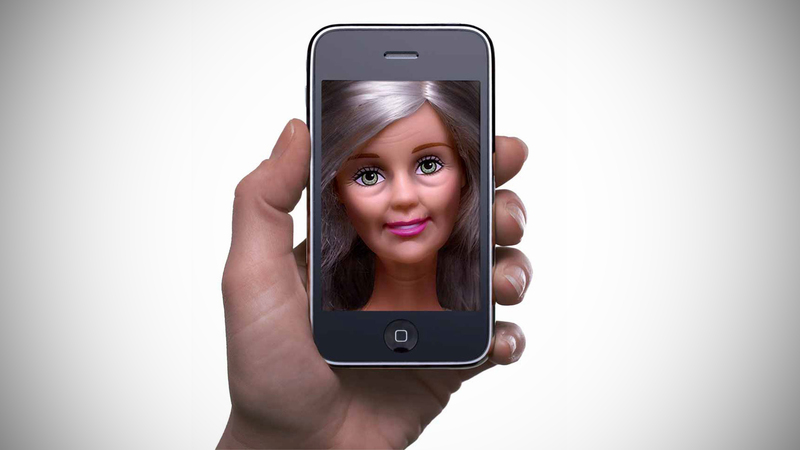 Ruth Handler insisted that “Barbie always followed the trends, she didn’t create them.” Indeed, Barbie’s designers have worked diligently to make her a reflection of events and fashions in a changing society (though in so doing they’ve undoubtedly helped ensure that certain social trends would gain a solid foothold). Barbie may not always appeal to adult sensibilities, but she has been successful in spite of it, because she unlocks the possibilities that a child can imagine. If what that child imagines is sometimes troubling, perhaps adults need to examine the society and values they have created for their children to emulate. Lizabeth Cohen, A Consumers’ Republic: The Politics of Mass Consumption in Postwar America (2003). Ruth Handler (with Jacqueline Shannon), Dream Doll: The Ruth Handler Story (1994). Lenore Wright, “The Wonder of Barbie: Popular Culture and the Making of Female Identity,” in Essays in Philosophy (January 2003).